As a leader of an ancient Mediterranean Power each player will need to master three roads to power to lead their civilization to dominance. The best contender for the crown of Civilization-light, Mare Nostrum is a semi-historical civilization-building game that doesn’t take an age to play, with an essential expansion that introduces mythological creatures and gods (included in this summary). Have yet to get it on the table but it looks great and has a good reputation. Nice work. Are you planning on updating this for the new 2016 version and expansions? Not at this time, I’m sorry. Since I have the original, there’s no need for me to get the new version. Wow, that was quick! I can understand that. Have you played it yet? No, it’s been in storage for years. But I recently got all my old games back and I’ll give it a whirl sometime. My Latin is rusty. 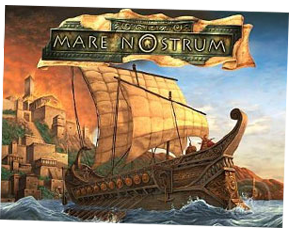 Is Mare Nostrum ‘sea of noses’ or ‘horses nose’? I googled it. ‘Our sea’…. not as funny!